Warning: This product is not yet available for ordering. 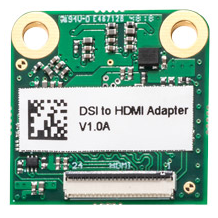 This is an add-on product for the Colibri iMX8X which converts the MIPI DSI signal available on the display FFC connector (X2) of the Colibri iMX8X to an HDMI 1.4 signal. This provides pin compatibility on the HDMI interface with all Colibri SoMs providing an HDMI Interface. This adapter can be ordered along with a Colibri iMX8X module. All the products can be ordered online at Toradex Webshop.